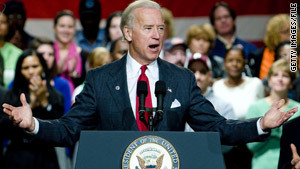 Vice President Biden downplayed news that Recovery.gov reported stimulus dollars spent in nonexistent districts. (CNN) -- The government Web site Recovery.gov is fixing errors that appeared to show hundreds of millions of stimulus dollars were spent in nonexistent congressional districts, the Recovery Accountability and Transparency Board said Wednesday. The errors, first reported by ABC News, were seen on Recovery.gov summary pages breaking down how many stimulus dollars were received in each state's congressional districts. Arizona's page, for example, showed the state's 52nd, 15th and 86th congressional districts received hundreds of thousands of dollars in stimulus money, according to CNN affiliate KNXV. However, no such districts exist in Arizona, which has only eight congressional districts. A report released Wednesday by the Franklin Center for Government & Public Integrity said it found such errors on pages for all 50 states, four territories and Washington, D.C. More than $6.4 billion in stimulus funds was shown as being spent -- and more than 28,420 jobs saved or created -- in 440 false districts, it said. The districts didn't exist, but the the money and jobs did, Obama administration officials have said. And the people who are to blame are recipients who apparently didn't know which congressional district they were in, the officials said. "We report what the recipients submit to us. Some recipients clearly don't know what congressional district they live in, so they just throw in a number for their congressional district," Ed Pound, spokesman for the Recovery Accountability and Transparency Board, which operates Recovery.gov, said Monday. In an appearance on Comedy Central's "The Daily Show" on Tuesday night, Vice President Joe Biden said the errors didn't indicate unaccounted-for spending but rather were the result of people who had "bad civics classes." By Wednesday evening, incorrect districts appeared to have been removed from the states' summary pages. Arizona's page, for example, listed only the state's eight real districts and a category called "unassigned congressional district," which appeared to contain all the money that had been attached to the nonexistent congressional districts. Arizona's "unassigned congressional district" row had $39,577,600, which is roughly the total that the Franklin Center said was previously linked to nonexistent districts. Money that was reported as having been spent in a nonexistent district would be moved, in databases on the site, to the correct one in cases where the recipient reported a ZIP code, the RATB said Wednesday evening. Recipients who didn't submit a ZIP code will need to make corrections "during the next reporting period, which begins on January 1, 2010," the board said in a news release. The errors raised the ire of U.S. Rep. Dave Obey, D-Wisconsin, and chairman of the House Appropriations Committee. On Monday, he said the mistakes "are outrageous and the administration owes itself, the Congress and every American a commitment to work night and day to correct the ludicrous mistakes." "Credibility counts in government, and stupid mistakes like this undermine it. We've got too many serious problems in this country to let that happen," Obey said. CNN's Alexander Mooney, Kate Bolduan and Jason Hanna contributed to this story.